Insight No. 1: Paris is not the only city where yoga classes are expensive—they’re expensive all over the western world! This is just how it is. The more time you spend bemoaning the cost of yoga classes, the less time you spend practicing the actual yoga. Is it productive to grumble about injustice? Always! It is through that very process of criticism that you gain valuable knowledge. Insight No. 2: The first thing to remember is that studios want students! All of the lower-priced deals assume that you, too, want to be a student. The offers are designed to encourage you to develop a dedicated and persistent yoga practice over time (known as Abhyasa in Sanskrit), and through that effort, to contribute to the lively and dynamic life of the studio and its community. That give-and-take is essential to your growth, and to the growth of those around you. Here are just a few examples of ways to save money on yoga classes. Don’t forget to check our most exhaustive listings here. 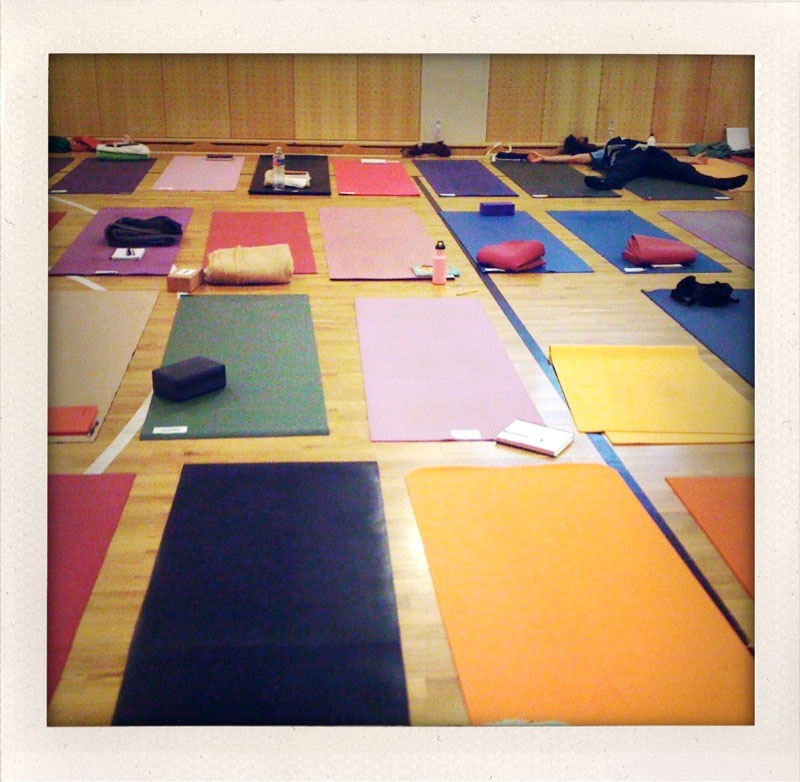 Most studios do not wish cost to be a barrier to practicing yoga. For this reason, almost all of them offer classes at reduced prices. These reduced fee classes are known as Community, and cost anything from zero to 15€. Depending on the studio, the Community classes are taught by recent teaching training graduates or by certified teachers. Both of these options are a terrific way to experience a new studio or teacher or yoga style, without committing to a monthly pass. A cours d’essai is a trial class, generally offered for free or a low fee. Offre/Forfait/Tarif/Carte Découverte are package deals that bundle multiple classes over a limited time period. For example: at one studio, 35€ might entitle you to 2 classes over a 7-day period, while at another, that same 35€ might encompass 10 days of consecutive, unlimited classes. Découverte deals impel you to attend multiple classes, giving you a more accurate sense of the studio’s ambiance. One of the beautiful things about France is that it acknowledges that students and those looking for work have a right to a decent quality of life. Many studios offer lower fees for full-time students and the unemployed. To claim this discount, you may be asked for supporting documents such as a student ID card, carte de demandeur d’emploi, etc. Don’t forget that a student in France is defined as being 25 years old or younger. If you’re going to be in Paris for a month or more, you may want to consider work/study or barter. Many studios need assistance, and actually advertise their specific requirements on their websites or in fliers at their studios: Desk or administrative help, people to clean the practice space, painters, etc. If the studio hasn’t publicized their need for assistance, just ask! In our experience, studios are receptive to this idea, particularly when the expertise being offered (graphic or web design, social media, photography, marketing, PR, etc) is something they lack the resources to afford. Your offer of service will be met with tremendous gratitude!